Green turquoise is a beautiful and striking alternative to the more commonly known blue variety. While all turquoise is primarily composed of hydrated copper aluminum phosphate, the color varies greatly depending on where the stone came from and the contribution of elements that formed it. 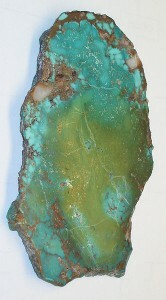 Green turquoise is formed in areas with a higher concentration of iron. The turquoise will often highlight the matrix or “veining”. This happens when the turquoise forms within a parent stone and the two become inseparable. Where Does Green Turquoise Come From? Today, green turquoise is considered an investment due to the increasing rarity of the stones. Collectors and jewelry artists often take special care to ensure the turquoise they obtain will maintain it’s vibrant color and stability – as green turquoise is known to lose color over time. To stabilize the green turquoise, it is common for manufacturers to apply a resin or wax coating to the stones. Stones with matrix patterns may be further stabilized to prevent fracturing over time. One of the more popular varieties of green turquoise is Emerald Valley. This deep green turquoise is mined in Nevada and is extremely popular with collectors and can even be found on the market. It is sometimes highlighted by a beautiful copper matrix, which makes Emerald Valley a unique and beautiful variety of turquoise. Damele is a chunky bright green turquoise with a high concentration of zinc that can produce stones ranging from yellow to bright green. Green turquoise really does belong in a class of its own. Its distinctive characters and beauty make it a prized addition to any jewelry collection or stone collection. No turquoise enthusiast should be without a nice piece of green. Copyright © Green Turquoise 2017. All Rights Reserved.